Starting OIT can be a nerve-wracking experience. We call it “Day 1” and it becomes the first day of your new life–for the whole family! 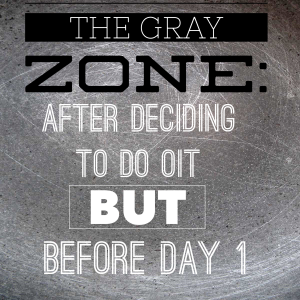 We call the period between when you make the decision to do OIT, and the day of that first dose, “The Gray Zone”. Once you commit, your parental instincts kick in and you doubt yourself and your decision. And your brains starts looking for reasons to cancel. Luckily, the doctors and staff like Dr. Baker and Marianne are used to first-day jitters, and set about getting the process moving. When you do “Customized OIT” with a knowledgeable doctor and nurse, you know you are safe. They will not give more than the body can handle. We see “symptoms” and “side effects” which are not anaphylaxis, but a signal that the body is adapting to the allergen. Tuesday, June 23, 2015 was our OIT start date. It was a weird morning. There was adrenaline running through the house as we ate breakfast and got ready for Mara’s first OIT appointment. I couldn’t help but think to myself as she ate breakfast, this will be our LAST peanut-free breakfast. Ever. Such a weird concept. You see, we’ve spent the last six years not only avoiding peanuts, but literally running in fear away from peanuts because peanuts can kill. We have been trained and conditioned to think of peanuts like a loaded gun. However, once you start OIT, you face peanut straight on every day as you eat your allergen…for the rest of your life. Mara felt nervous. Richard and I felt nervous. G & Pa who were hanging back at the house with Ari felt nervous. We said good-bye and made our way through Portland traffic to Dr. Baker’s office. Hoots the Owl came with us for extra support. We packed as if we were going on an all night camping trip. We brought a bag full of food and a backpack full of entertainment. Dr. Baker has an assistant, Marianne, who heads up their OIT clinic. After height and weight were measured, Mara’s first dose was given by Marianne. I thought I would be a nervous wreck, but in all honesty, it happened so fast none of us had time to freak out! Mara was given .25 mg of peanut flour dissolved in a syringe with grape juice. Peanuts come in all shapes, but an average peanut contains about 300 mg of protein (so .25 mg is about 1/1200th of the protein in 1 peanut). We were told that only 1 patient in 7 years had reacted to the .25 mg. Mara sailed through her first dose. After a 20 minute wait, they doubled her dose to .50 mg. Again, Mara sailed through. Her dose was doubled again to 1.25 mg, and finally to 2.50 mg. After the 2.50 mg dose, Mara began to feel tightness in her chest. They closely monitored her vitals (blood pressure, breathing, etc. ), and although she felt tightness, her vitals were fine. The tightness disappeared fairly quickly, and we ended her dosing for the day. Since the tightness in her chest is considered a reaction and she had that happen at the 2.50 mg dose, they sent us home with 1.25 mg of peanut protein (diluted in grape juice) to be taken twice daily (a morning dose and an evening dose). The doctor told us that every patient is different in terms of how far they get on the first day. It is not uncommon for some patients to make it to 8 mg on the first day. We were happy and content that Mara made it through 4 doses that day, and we are pleased that she is tolerating 1.25 mg of protein. For the first time in six years, we have a baseline for Mara. She is tolerating 1.25 mg of peanut protein. This is a fact. The first dose at home that night was another big step. It’s one thing to watch the nurse administer the doses at the office, but it’s another thing to do it at home without medical backup. There is protocol to follow. She needs to have food in her belly, and she needs to have a one hour rest period (basically not get her heart rate up) after each dose. We did our first home dose before dinner. We had her eat a hearty snack and then take her dose. She immediately belched after taking it, and then her tummy felt a little “off” and she wasn’t all that interested in eating dinner. We called Marianne who said it may take a few doses for her body to adjust, but that she wasn’t concerned as long as it wasn’t severe (which is wasn’t) and went away quickly (which it did). Wednesday morning, we dosed after breakfast and other than a belch again, she had no symptoms whatsoever. She had her 1 hour rest and then we headed off for a super fun day at the zoo (thanks to some very kind and generous friends of ours who purchased a zoo membership for us!). Wednesday evening’s dose was given after dinner and was very uneventful. After a 1 hour rest period, kids were happily playing in the sprinkler. We are hoping that this process is so boring that there will be nothing to blog about until we get to her graduation at the very end! We will keep you posted!